When it comes to cannabis concentrates, you usually have to choose between quality or affordability. But with Alpine Vapor, you have both–along with many choices. Alpine Vapor takes pride in producing the purest, safest, and most discreet marijuana products available in California. Their carts, syringes, and pens are made with all cannabis consumers in mind, from experienced medical marijuana patients to newbies. The company’s cutting edge technology and dedicated attention to detail create perfectly dosed concentrate-based products that taste amazing and deliver serious results. All Alpine Vapor products start with the highest quality sun grown cannabis flower cultivated in Humboldt County using organic farming techniques. Before it’s processed, the flower is tested to make sure every batch remains free of pesticides, microbials, and other potentially harmful contaminants. After testing, Alpine Vapor gets to work using a supercritical CO2 fluid extraction (SCFE) method, arguably the cleanest extraction method available today. This technique produces a solvent-free, flavor-rich oil full of cannabinoids and no residual plant matter. But that’s not good enough for Alpine. They take the purification process even further by refining their oil using state-of-the-art molecular distillation methods. This extra step elevates their concentrates to a level of purity and potency that’s easily tasted and felt. 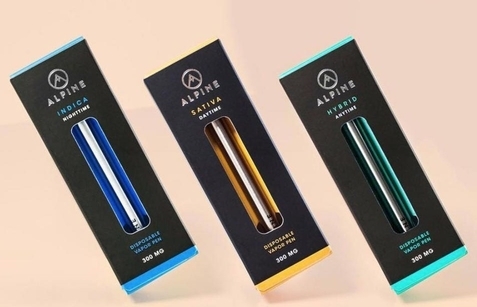 Alpine Vapor makes consuming on the go easier than ever with these disposable pens. They have a sleek and simple design, with equally modern packaging to match; their silver exterior looks androgynous enough to fit perfectly in a woman’s purse or a man’s pocket. The best and most useful part about this throw-away? The see-through panel to easily measure how low yours gets. You’ll never have to worry about charging a vape pen or running low without realizing it again! Alpine Vapor’s disposable pens test at around 40% THC and last for over 150 puffs. They come in three flavorful options: sativa, hybrid, and indica. Because of their extraction and purification techniques, you can expect incredibly pure flavor without the harsh lung irritation. One pen will cost about $25, a solid deal for a solid product. Forget carefully squeezing tiny bottles of e-liquid into your cartridge, making a mess and wasting money. 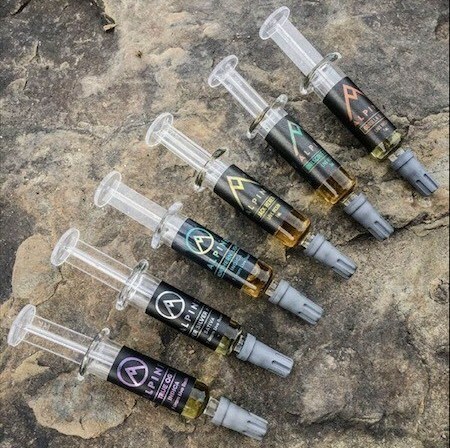 These medicinal vape oil syringes make refilling your cartridges hassle-free. 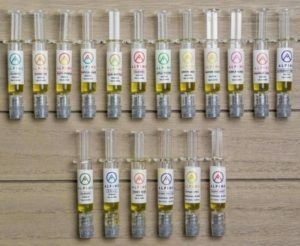 Each one gram syringe tests at around 35% THC, depending on the strain, and costs between $35-$45. A factor that really sets Alpine Vapor ahead of the competition? In addition to classic sativa, indica and hybrid varieties, there are several strain-specific flavors. For sativa lovers, choose from Apple Pucker, Blueberry Melon, Double Bubble, Lemon Jack, Orange Julius and Pinkfruit Diesel. If indicas are more your thing, try Fruity Pebbles, Lavender Ice Cream, Night Shift, Sour Skittles, Tangerine OG and Tropical Haze. Or, if you prefer the best of both worlds, check out hybrid’s Chill and Honey Rose. These quality, potent live resin syringes are well worth the investment. For around $55-$60 per gram, you get a concentrate that tests at around a whopping 75% THC. Solvent-free live resin with such a high percentage is hard to find. Their price and quality are an unmatched combo. The best part about these syringes, aside from the super high quality? Say goodbye to messy dabbing! Each is packaged in medical-grade borosilicate glass, allowing for perfectly doses to directly hit the nail when it’s hot and ready. Yet these distillates aren’t just for your butane torch and rig; add a dab or dollop of live resin to your joints, blunts, and bowl hits for extra kick. Alpine Vapor’s live resin syringes come in a variety of popular strains like Skywalker, GG #4, Jack Herer, Super Silver Haze, Northern Lights, GSC, True OG, and OG Kush. Like their syringes, the live resin vape cartridges are on another potency level. Testing at around 72% THC, you’re sure to experience a dab high with the convenience of a vape pen. These carts are bursting with natural flavor so you can actually taste the cannabis flower they’re derived from. Top notch potency, purity, and flavor? That’s a win-win-win. A half gram (.5) cartridge will cost $30-$40 and a one gram cartridge runs for $50-$60. 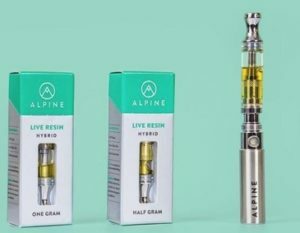 Alpine Vapor’s cartridges fit on most 510-thread batteries, or you can purchase their own branded battery kit. If you prefer a more significant CBD presence in your concentrates, Alpine Vapor doesn’t leave you behind. 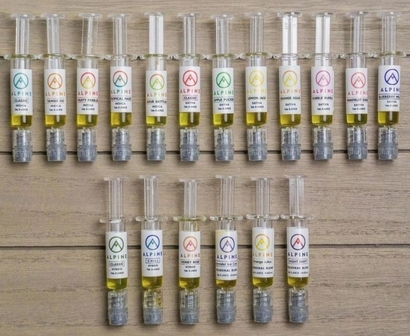 Their CBD-rich vape cartridges come in 3:1 CBD to THC or 1:1 CBD to THC ratios, allowing you to pick and choose which formula would help the most. Their CBD blends promote a clear-headed high great for all-day use, especially for those who want the medical perks without the overwhelming high. 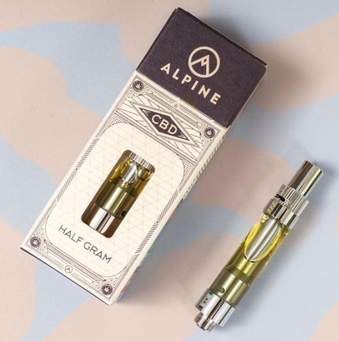 Alpine’s CBD Cannatonic and Harlequin derived cartridges come in half or one gram options costing about $45 and $65. Like the live resin cartridges, these can also be used on any 510-thread battery kit. Alpine Vapor’s MMJ products are available in dozens of dispensaries across California. For a full list of vendors, check out their website below. Or if you’d rather have Alpine Vapor carts, syringes and pens sent directly to your home, use Nugg’s medical marijuana delivery service. Find local dispensaries that deliver these products and more. It’s free to sign up, but you must have a valid MMJ recommendation before ordering. Don’t have one? Don’t fret. NuggMD has licensed cannabis doctors available online, no appointment necessary. After meeting the criteria and being approved via live video conference, your recommendation only costs $39. Now you can visit Nugg and immediately order. It’s that easy! “The hybrid live resin 1g cart hits you like a mack truck with THC written down the side for sure, but evens out within a few minutes and doesn’t leave your energy level sapped…It’s actually the most neutral high I’ve probably ever experienced.” —Joe C.
“Alpine does not disappoint! I had only been a fan of the live resins for the longest time and thought that the eliquid may not be as good…I was wrong! The disposables are great tasting- heavy hitting, sleek–and a really nice price point. The newest flavor, sour skittles is delicious!” —Lily J. “I’m not too crazy about cartridges. I’d rather dab. BUT!!! The Alpine cartridge changed all that for me. You get big rips and tasty clear premium quality product. Out of all the brands I’ve tried, Alpine is by far the superior product.” —Ralphy B.